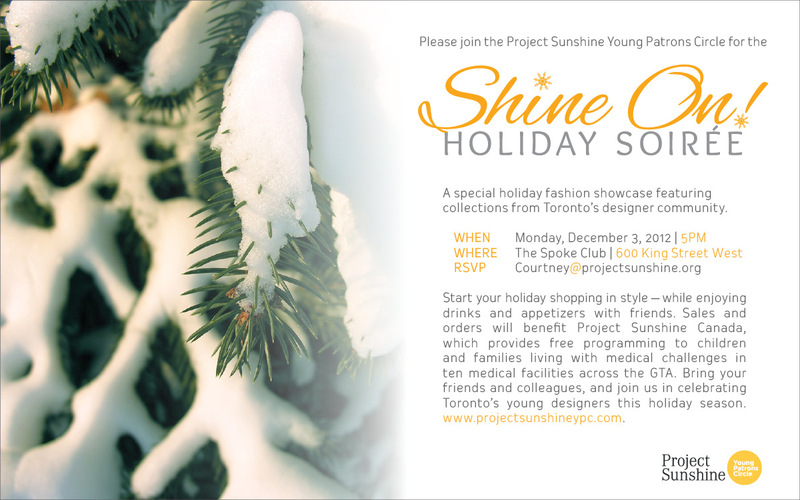 I was recently invited to attend Project Sunshine Canada YPC's Shine On! Holiday Soirée in the city; an event that aims to tastefully combine local talent and Fashion with local issues and real support. As everyone is aware, I am a huge believer in supporting Toronto's local design market in any way that I can - but this goes much further than just that. Chaired by Jennifer Kaiser, Shine On! will showcase young, local Fashion Designers and their seasonal collections to a fun and fabulous crowd of buyers! All proceeds will be benefiting Project Sunshine Canada; a non-profit organization that provides free, public programs to children who face medical challenges (along with their families) in ten medical facilities across the GTA. The YPC (Young Patrons Circle) consists of young professionals who are passionately devoted to the work of Project Sunshine Canada; developing events to help raise awareness for the organization and empower it's ongoing work. Shine On! will allow consumers to get a fabulous kick-start to their holiday shopping - enjoying drinks, food, friends, and a wide variety of local creations to choose from. This year's event will feature a talented, young, and ambitious roster of Artisans (and their brands) that produce everything from house wares, to hand-made accessories, to entire clothing lines - LABEL (whom we all know and love! ), Valentine K, Bel Ami Hair Accessories, Toveren Jewelry, One-Off Vintage, and White Feather are just some of the names showcasing their talent this year. I am thrilled to be attending this year's showcase. Local Fashion with a local message, and it can't hurt that the holidays are just around the corner! Join us this year, and be inspired not only by local design, but by the community action it will be a part of. Shine On! will be taking place on Monday, December 3rd, 2012 (that's next week!) at The Spoke Club on King West from 5:00 pm - 9:00pm. See you there! Denis Gagnon Spring 2013 Look Book / FIRST LOOK! © 2012 DYLAN DIAS. Simple theme. Powered by Blogger.